Wouldn't it be wonderful if you could ask Patti your own relationship questions and receive her expert advise? You are in luck! Now is your chance! Leave your questions about love or friendship here in a comment or tweet them to me @tsue1136 and @pattistanger with a link to this post for a chance to have Patti answer your questions in an upcoming video from Alloy TV. Readers may also enjoy soon to release film, Something Borrowed, set for release on May 6th! 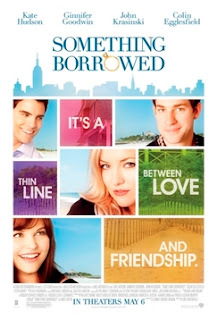 Something Borrowed, based upon the best selling novel by Emily Griffin, stars Ginnifer Goodwin, Kate Hudson, John Krasinski and Colin Egglesfield. In the movie Something Borrowed, Rachel and Darcy’s lifelong friendship collides with true love, when perpetual good girl Rachel unexpectedly ends up in bed with the guy she’s had a crush on since law school, Dex…who just happens to be Darcy’s fiancé! This leads to unexpected complications and potentially explosive romantic revelations in all of their relationships…. See the Something Borrowed Movie Trailer from Warner Bros here. Don't forget to add your questions via comment below and feel free to tweet them out as well! I have not been compensated for this post. The opinions above are both honest and my own. Images and information taken from various websites associated with Allow Digital, Bravo, Patti Stranger and Emily Griffin. Thanks for the info. I haven't heard of this movie before! I haven't heard of this movie either, but I like Kate Hudson! Oh! I want to see that movie! My question is, do millionaires always want the hottest girls? I watch her show all the time, but there never seem to be any really "normal" girls! HAH HA! I have a question for Patti! I can't believe this, but I slept with my best friend's boyfriend. We've always had great chemistry and the other night it just happened. But I really don't want to lose my best friend, she means the world to me. What do I do? Do I tell her? What if I really like the guy? Help! I haven't heard of this movie before!